The Watcher Millennia ago, he fell from heaven for her. Can he face her without falling again? Fascinated with ancient civilizations, seventeen-year-old Mia Crawford dreams of becoming an archaeologist. She also dreams of wings—soft and silent like snow—and somebody trying to steal them. When a horrible creature appears out of thin air and attacks her, she knows Michael Fontaine is involved, though he claims to know nothing about it. Secretive and aloof, Michael evokes feelings in Mia that she doesn’t understand. Images of another time and place haunt her. She recognizes them—but not from any textbook. In search of the truth, Mia discovers a past life of forbidden love, jealousy and revenge that tore an angel from Heaven and sent her to an early grave. Now that her soul has returned, does she have a chance at loving that angel again? Or will an age-old nemesis destroy them both? Ancient history is only the beginning. Author Lisa Voisin A Canadian-born author, Lisa Voisin spent her childhood daydreaming and making up stories, but it was her love of reading and writing in her teens that drew her to Young Adult fiction. A self-proclaimed coffee lover, Lisa can usually be found writing in a local café. When she's not writing, you'll find her meditating or hiking in the mountains to counteract the side effects of drinking too much caffeine! Though she’s lived in several cities across Canada, she currently lives in Vancouver, B.C. with her fiancé and their two cats. This tour goes back to the age of legends. The author has taken a deep dive into rich history, bringing his love of fantasy with him. I have to be completely honest… If I was walking in the book store or searching for a book on line this would have picked up the book and thought the cover was beautiful….but reading the descriptions probably would have made me put it back on the shelf. This time in History, the time of Caesar is one of my least favorite times. When I started reading I thought this is probably not going to be one of my favorite books. I was given this book in exchange for an honest review, so I thought I am just going to give it a chance. I am so glad I did. I really enjoyed this book. This first book was good, but the following in the series are even better. So let’s start with book one. I found myself attached to sweet Guiamo immediately. I was blown away at the heartless people he had to live with and then was abandoned by. When abandoned Guiamo never stops to feel sorry for himself, he sees a fisherman and asks to work with him and in return the Fisherman takes Guiamo in and cares for him. Soon we are introduced to another character by the name of Gabinius who I also really love. Gabinius is such a kind and loving man. I liked that Guiamo is always learning new things and doing whatever is asked of him. This may be totally off base but in “MY OPINION” Guiamo reminds me of a character from the Bible, Joseph, who is sold by his brothers. The brothers thought there family would be better off without him, and yet Joseph is the one who prospered, a lot like what Guiamo went through. Yes, I am sure it is not supposed to remind me of that, but it does. Guiamo was abandoned and faced with trials and yet did everything he could to better his life and all that was around him. He always made the best of whatever situation he is in. The book gets intense towards the end and gets me even more excited to pick up the second book in the series! 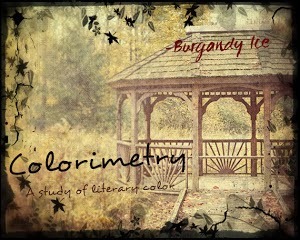 I hope you all enjoy it. I want to start with a quote in this book that I love love love that is said as Cumoro (aka) Guiamo and Sreng (another character we are introduced to in this book) are faced with battle. Sreng says "It is far better thing to fight for a hope, however faint, than to linger in fear while suffering the pangs of doubt ever gnawing at your soul." This book is filled with battle after battle and I couldn't put it down. I found myself loving Curmoro (Guiamo) even more in this book. He amazes me. I love his connection with the land and the animals. I love that no matter what situation he is in, he is always doing the best he can. The battle scenes are so intense and some of the descriptions were so real to me that I found myself clenching my fists waiting for the outcome. This series is just getting better. I cannot wait to see where the adventure takes me next. Thanks Marshall Best for introducing me to an era I probably never would have read about if it wasn't for these amazing books. Again, I need to begin by saying I am new to this whole review thing, and I don’t think I have quite figured out how to do a “real” review without giving important details away. 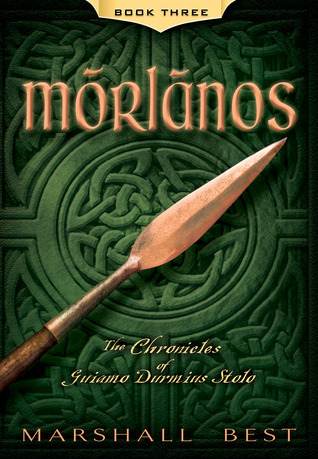 In this book Guiamo is known as Morlanos which means “filled with greatness”, such an appropriate name for him. We are introduced to more creatures in this book and more intense battle scenes. Some of the descriptions I have to admit grossed me out a little bit, but they were fantastic. Morlanos has grown into a great young man who is favored by the Gods. What I found interesting in this book is that they refer to the “good Gods” and the “bad Gods”. Morlanos and his people are faced with battle after battle with creatures that are almost impossible to kill. If the book was a movie I would have been on the edge of my seat the whole time. I have been fascinated with how much I have connected with characters lately and how much an affect written words can have on me and my emotions. This book is intense. 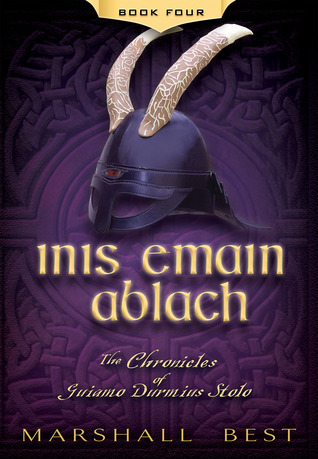 Morlanos has to be trained for 19 years before he can get married, but is finally introduced to a woman in this book, and I really like the character. Her name is Sona. Guiamo says of Sona (he appreciated her uncanny ability to know when to remain silent, listen, not with mere patience, but with sincere interest as his need to speak percolated to the surface). How many times have we needed that someone to just listen. With every book I keep thinking that it cannot get more intense but it seems that Marshall Best has a fabulous way of describing battle scenes. I know I have said it before but I am still surprised at how much I love this series because it’s not something I would have read if not given this opportunity to review. I am also thankful for the glossary at the end of the book, because there are a LOT of unfamiliar words and terms used in the series. I love reading a book that teaches me new things, even if it’s just how people spoke during a particular time in history or just words that are not used very often. I hope that you enjoy reading this series as much as I have. This book has probably been my favorite so far out of them all. I am probably getting something totally different out of this book than most people do, there are quite a few times in this book that I thought to myself “this is the creating of the world”, and a lot of this is similar to the Bible. I may be totally off base, but these are my thoughts. Guiamo continues to be an amazing young man. He is faced with terrible hardships in this book and is caused great pain, yet he still does all he can to make the world a better place. He finds himself losing favor with the Gods and some of the people. It seems like just when there is a resemblance of peace something else happens. There is so much contention in this book. I think Guiamo is such an honorable and loyal man. He stays true to the things he has been taught regardless of whether they are popular or not. He finds out who his true friends are and then is saddened by things that happen between him and his friends. Relationships that I thought would be life long are challenged. Guiamo translates some ancient papers, and in so doing causes a little rift, yet he continues because he knows it’s the right thing to do. Yet another reference to scripture…in my opinion. Guiamo finds a way to travel between his world and the world of the Gods, and it makes for some interesting encounters. There are so many things I want to say but don’t want to spoil the book for those who haven’t read it. I may have done that already but that was not my intention. There are a few things I am going to say that you may want to stop reading now because they MIGHT spoil a little. Guiamo finally gets word back to his family that he is still alive, and in return is rewarded with some sweet letters from those who helped raise him. This may have been the best part of the whole book for me. I love that Guiamo gets a taste of his home and his loved ones. It was one of the sweetest moments as he sits to read the letters from his loved ones, being so thankful and relieved to find out after many years that he was still alive and well. I got a little chocked up at one of the letters. I think I said this at the beginning of my reviews, but I am going to repeat myself. I am so glad I had the chance to review these books, because they are totally out of the “norm” for me. I would have walked by them in the book store and thought the covers were awesome, but when I read what they were about, and when they took place I would have put them back on the shelf and not given them a second glance, and now I know I would have really missed out on a great series. I cannot wait for the saga to continue. Marshall Best is a great writer. I am glad I ventured out of my “comfy” zone and was introduced to this great series. I honestly hope that if you have this on your “to read” list that you enjoy it as much as I did, and if you don’t add it! You won’t regret it! This is such a great story! If you like battles, this series has plenty of them. It’s very clean although some of the battle scene descriptions grossed me out; I consider this series very clean. Source: I was given all four of these books to download from Smashwords in return for an honest review. I was not compensated in anyway for these reviews. These are my PERSONAL thoughts on these books. $3 off each book through Createspace. Combining legitimate legends with actual historical events, Marshall Best weaves an epic story that portrays the ancient world as it might have been, a world which the ancient historians recorded as fact; a time when gods ruled the earth and strange creatures dominated the land. It is the era of civilized conquerors exploring distant and primitive new lands. Scant recordings left to us today only touch on the fringe of the fantastic and brutal reality that existed in those distant lands of the west. Into this age, young Guiamo enters the world stage as the great game-changer, and by his hand the gods and beasts become destined to disappear into myth and legend. In 60 B.C., ten-year-old Guiamo Durmius Stolo, an exceptionally gifted Roman orphan, is abandoned in Gaul . Left to fend for himself, Guiamo is set onto a path of legend. Recognized by the gods as having world-changing talents, he is given a weapon that changes his destiny and the world’s forever. Guiamo Durmius Stolo sails in 55 B.C. with Rome’s 7th Legion as Julius Caesar invades Britain. But Caesar has not before encountered the Fomori, a dominion of wicked creatures which wage war against the human inhabitants and dominate much of Britain. Armed with his god-made spear, Guiamo joins with the tribal kings against their Fomori foe when Caesar departs. Having destroyed the Fomori in Britain , Guiamo Durmius Stolo decides in 51 B.C. to bring the Cruthin people, once slaves to the Fomori, to Ireland , but encounters the Fomori who reside there as well. Guiamo discovers that the gods venerated by the Druids are unworthy. The gods are displeased with him and begin to work against him. In 50 B.C. 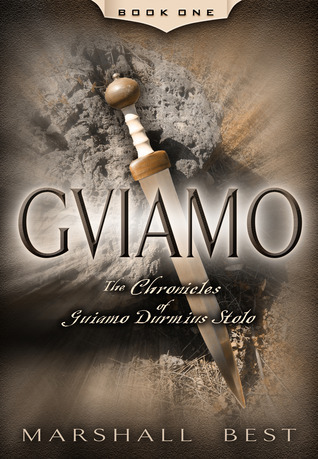 Guiamo Durmius Stolo finds himself victor over the detested Fomori whose leader, Cichol, is slain and those few who survived are scattered. 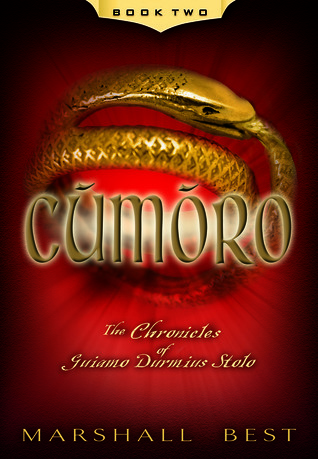 Guiamo explores the secret places where Cichol kept his most important secrets and discovers there the treasures of Cichol's master, the goddess Domnu. Marshall Best is an avid reader, father of six and business owner. In the past several years he has found his love of writing as well. 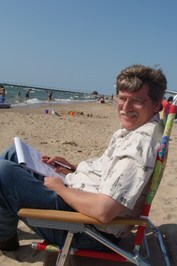 What began as a desire to write a story for his children has evolved into a nine book series. Marshall has done extensive research into the history behind the legends, people and places of England, Scotland and Ireland involved in his books. He loves being able to weave real people and legends into his stories making them come alive. He is definitely a writer that tends to the details often mapping out timetables, calendars, geneologies, etc. that pertain to his book to ensure that it is as realistic as possible. Marshall also enjoys putting real life issues into his books, delving into a bit of philosophy while entertaining with orcs, dragons, magic and battles. He is someone who loves a grand adventure but makes sure it's not a shallow one. Ends 12/20. Please see restrictions on Rafflecopter. Sign up to receive invites for upcoming Prism Tours here! Can two worlds collide in dreams? Crossroads, Between, Beyond, Eternity, Halo City-novella Protecting her from the fallen was his duty. Falling in love was never part of his plan. Loving her was forbidden. Being with her was all that mattered, even if it meant he would be exiled for all eternity. Claudia Emerson's life is about to change when her good friend, who coincidentally shares the same first and last name, dies in a tragic accident after the homecoming dance. Distraught at the loss of her friend, Claudia's dreams become tumultuous, and through them she mysteriously travels to another world called Crossroads. Unknown to her, Crossroads is like a second heaven, a place between heaven and earth, where the souls of humans in comas or near death experiences may wander. There, she unexpectedly meets Michael, a nephilim--half angel, half human. It turns out that this isn't her first visit, which is an enigma, for she has no recollection of being there, and is told that no human has crossed over...until Claudia. Now that she's been there, fallen and demons are after her, suspecting she must be special, and it is up to Michael and the other nephilim to protect her. Her dream becomes a nightmare as more secrets are revealed about who she really is, and the true identities of the people she loves most. The situation becomes even more complicated when she is unable to hinder her feelings for her swoon-worthy guardian angel. Can Michael fight his growing feelings for Claudia and protect her as a guardian angel should, or will he be too blinded by human emotions and the struggles of being who he is? Though Phillip had already told me that I wouldn’t be able to tell the difference between an alkin and a fallen, it was confirmed as I watched the battle. They looked just like the alkins as the two sides battled with swords. Watching, I noticed that Michael had one too, but where had it come from? “No!” Michael shouted, suddenly standing directly in front of me. “You don’t need her. She’s just a human.” “Get them!” Aden shouted again. During the entire fight Michael stayed by my side, protecting me. They fought so swiftly that even with my flashlight it was hard to distinguish alkins from the fallen. I focused intently, trying to figure out who was who, but it was no use. They were too fast for human eyes. I pointed the flashlight, hoping to blind or distract them, but that also proved to be pointless. It was only useful for my vision. In the blink of an eye they were here, there and everywhere. The clanging of swords colliding was painful to hear. As the screeching sounds continued, all I could see were sparks as the swords made contact, as if we were in the middle of a lightning storm. Fearful of any alkin getting hurt, I covered my ears, hoping that it would end soon. Suddenly, Aden raised his hand toward the stars, and the fallen stopped. The sounds of the swords crashing against each other came to a dead halt. Aden started circling around Michael and me. As he drew closer, I could see that he looked exactly as I remembered him from my dream. The wrinkles on his forehead defined his age, and though I conceived him as evil, his voice scared me more than his appearance. Aden never lifted a finger to fight; instead, he relied on the fallen to carry out his battle strategies. “Michael, come with me. I’ll give you anything you want.” “There is nothing I want from you.” “They’ve turned you against me. I should have killed you when I had the chance.” Aden’s eyes raged with anger. “They didn’t turn me against you. I did it of my own free will.” “Move out of my way!” Aden shouted. “You’ll have to go through me first!” As Aden continued to circle around us, I could sense movement from the fallen, edging closer to Michael and me. The alkin must have sensed it too as they positioned themselves right behind us and immediately began to attack the fallen. Michael moved me to the left and then to the right, fighting while shielding me. Though the fallen were fewer in number than before, they were retaliating in full force. In the midst of all the chaos, I lost my grip on the flashlight, and it tumbled off the cliff. Instinctively I reached for it, and in that split second someone or something collided against me, and I plummeted off the cliff. Gravity was pulling me faster than my body could resist. I’d always heard that at the moment of death, one’s life flashed before their eyes; all the moments that had brought them to that point, big or small. All I could think of was death itself and the one person who had changed my life forever—Michael. BookBlast Giveaway $50 Amazon Gift Card or Paypal Cash Ends 12/15/13 Open only to those who can legally enter, receive and use an Amazon.com Gift Code or Paypal Cash. Winning Entry will be verified prior to prize being awarded. No purchase necessary. You must be 18 or older to enter or have your parent enter for you. The winner will be chosen by rafflecopter and announced here as well as emailed and will have 48 hours to respond or a new winner will be chosen. This giveaway is in no way associated with Facebook, Twitter, Rafflecopter or any other entity unless otherwise specified. The number of eligible entries received determines the odds of winning. Giveaway was organized by Kathy from I Am A Reader, Not A Writer and sponsored by the author. VOID WHERE PROHIBITED BY LAW. LAUNCHING TO THE LEGENDARY TOUR hosted by PRISM BOOK TOURS!!!! This tour goes back to the age of legends. The author has taken a deep dive into rich history, bringing his love of fantasy with him. The result? "Guiamo by Marshall Best is an outstanding historical novel of life and times in the ancient Roman era." "There were times I had to remind myself this was fiction. It was easy to follow the story and keep up with each new twist and turn. I really had trouble putting this book down." Follow the Chronicles of Guiamo as they unfold on the tour! Combining legitimate legends with actual historical events, Marshall Best weaves an epic story that portrays the ancient world as it might have been, a world which the ancient historians recorded as fact; a time when gods ruled the earth and strange creatures dominated the land. It is the era of civilized conquerors exploring distant and primitive new lands. Scant recordings left to us today only touch on the fringe of the fantastic and brutal reality that existed in those distant lands of the west. Into this age, young Guiamo enters the world stage as the great game-changer, and by his hand the gods and beasts become destined to disappear into myth and legend. One of the most vivid scenes in Guiamo is where the god Lugus bestows special powers upon him.....as you read it you can almost see the scene as it would play out in a movie....the excerpt is below. This scene finds Guiamo with his druid teacher Susama. Guiamo brought Susama to the sacred grove atop the high hill near Gobedbiacum. Guiamo noticed that while the cold weather carried a wind, it was not strong enough to move the limbs of the trees which swayed dramatically along their way. Susama noticed the activity of the trees, too, and observed, “Lugus eagerly awaits your arrival.” They trudged along watching the branches moving energetically around them. Guiamo pointed out that the trees a short distance farther were nearly still. Ebeth says, "In telling this story, Best is able to richly lay out the history of the land and the people - and he does so without confusing the reader. That is a gift and a talent." The third book in an excellent series and again the authors understanding and research into the myths and legends add excitement and interest to the story. The writer totally enthralls and absorbs the reader into a time gone by and again you feel you are there fighting and wanting to warn Morlanos of the danger he is facing. 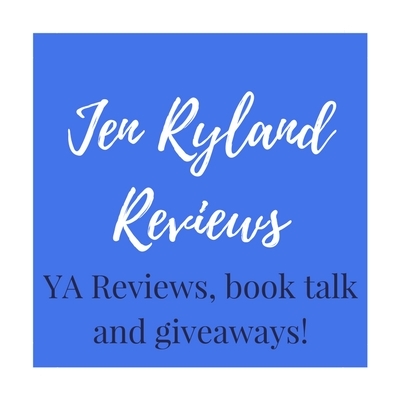 A Week of Interviews and Giveaways! WHICH chapter or segment of advice did you learn the most from while researching the book? I think we’d all have different answers to that. So many of the chapters and tips written by the others are gold dust. Not just as eye-openers, but reminders of things I knew but had forgotten about. Putting the book together has been an inspiring experience, and totally reinforced my decision to go the independent route. Print copies available to win in US/Can/UK. eCopies available Internationally. Open to those who can legally enter and are able to receive winnings. Winners will be drawn randomly on Rafflecopter. Winners will be awarded according to their preference in the order they are drawn. If there is no preference indicated, they will win according to the consecutive posting order. Winners will be announced on Rafflecopter and notified by email after the giveaway has ended. They will have 48 hours to respond or a new winner will be chosen. This giveaway is in no way associated with Facebook, Twitter, Rafflecopter or any other entity unless otherwise specified. The odds of winning are determined by the number of entries. This giveaway was organized by the authors of Triskele Books and Prism Book Tours: www.prismbooktours.com and sponsored by the authors. VOID WHERE PROHIBITED BY LAW. DEAD DREAMS - Excerpt Tour Grand Finale!!!! My "To Read" List is Growing WAY too fast! 5 DAYS LEFT TO ENTER GIVEAWAY!!! !